Recent University of Delaware graduate Radhika Samant always envisioned herself beginning her career in the environmental field but when she was offered a job to work at Thomson Reuters in New York City following Commencement, the opportunity was too good to pass up. Samant, who graduated in May with a bachelor of science degree in environmental and resource economics from the Department of Applied Economics and Statistics (APEC) in UD’s College of Agriculture and Natural Resources and a bachelor of arts degree in economics from the Alfred Lerner College of Business and Economics, will begin work in the Thomson Reuters client specialist associates program. She will shadow current specialists and meet with clients and guide them through the process of using the company’s products and services, all the while getting feedback from those clients and reporting it back to the firm. “I will be the face of Thomson Reuters for our clients,” said Samant who added that although the job isn’t directly in the environmental field, she is thrilled to work for a company that takes initiatives to be environmentally friendly. “They truly embody those green principles, so I’m excited to be working for a company that’s more green in its vision than others,” said Samant. Another thing that has Samant excited is the fact that she will be living in New York City with an office in Times Square. “It will be overwhelming coming from a small town in Delaware – and Delaware will always be my home – but I’m excited to explore the city and have a new beginning,” said Samant. Rigorous job application As for the application process, Samant explained that she was chosen out of a field of over 800 applicants nationwide, although she didn’t know the job was that competitive when she initially applied. “I had no idea there were 800 applicants for the New York office – they’re also launching the client specialist associates program in Chicago and Toronto – and they narrowed it down to a couple hundred for a video interview,” said Samant, adding, “I’m glad I didn’t know how competitive it was because I kind of just put my best foot forward.” After the video interview, Thomson Reuters narrowed the field to 36 finalists and Samant traveled to New York City for an all-day interview process that involved group and individual activities. “I had to prepare two pitches beforehand and had individual interviews, and they observed us doing group scenario work, so it was definitely the most difficult interview I’ve done. But I really liked it because it gave you a lot of opportunity to explain why you’d be good for the job,” said Samant. Samant said that there were around 19 client specialist associates hired in all of North America, with 10 of the new hires in the New York office. She expects that the new associates will be working as a team until they start getting their own individual clients. Career advice For UD students who will be graduating and entering the world of work, Samant said her best advice is to use the University Career Services Center’s Blue Hen Careers system, to take advantage of the opportunities given to them by the UD faculty, and to keep an open mind. “Blue Hen Careers is where I found most of the jobs that I applied to. I found this one on Blue Hen Careers and I would say that you should just apply for anything,” Samant said. “If you think you’re under qualified or even overqualified or if you think it’s a job that you hadn’t considered before, just apply everywhere and keep your ears and eyes open. Just be persistent and don’t get discouraged at all.” She praised the assistance offered by UD faculty members, citing Steven Hastings, professor and associate chair of APEC. She said professors are “always helping you out, and sending you different job postings – it will be fine.” Samant said she interviewed and applied for different jobs throughout her senior year, and was surprised at how difficult it was to find a job. “Thomson Reuters was the first job that I interviewed for right after I graduated and it was the one I ended up getting. I feel very lucky and I’m really excited,” said Samant. 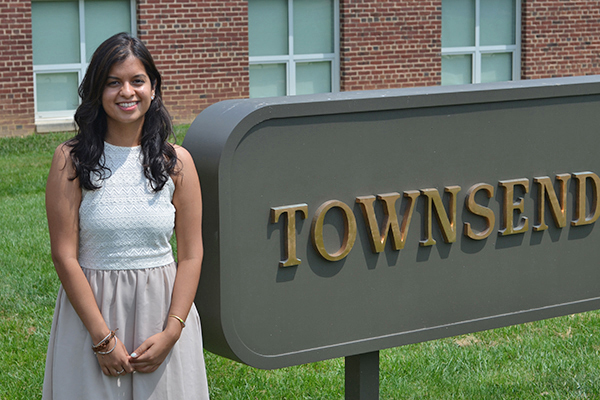 Being active with internships was also key for Samant, who did an internship each summer as an undergrad at UD – one in entrepreneurial studies, one with APEC professor Tom Ilvento and one with the Delaware Water Resources Center. Samant also said that having the double major allowed her to get exposure to the world of economics and the environment. “I think with an economics degree, it’s not as specific so it leaves a lot of room to study what you want to study,” she said. “Not only did I study economics in depth but I also got to take those concepts and apply them to natural resource management and environmental issues. That’s something that I could take either way – I could go down the environmental route or go down the business route, it’s an intersection of both so I think that it was really cool to have that.” She also said she enjoyed studying in APEC. “I feel like faculty in this department actually know their students by first name, which is hard to find in a lot of bigger universities. But Dr. Hastings has helped me with everything from classes to internships to jobs. He really had a huge impact on my college career, and the entire faculty was great.” In addition to Hastings and Ilvento, she cited Joshua Duke, professor of food and resource economics, economics and legal studies, who she said was a favorite. “Everyone in the department is really great,” said Samant. Article by Adam Thomas Photo by Steve Hastings This article can also be viewed on UDaily.